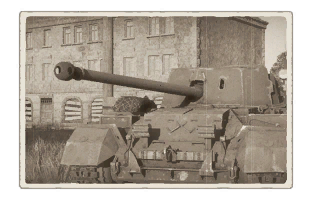 The SP 17pdr. Valentine (also known as the Archer) is a Rank II British tank destroyer with a battle rating of 3.3 (AB/RB/SB). This tank destroyer was released along with the entire British tree line in Update 1.55 "Royal Armour". 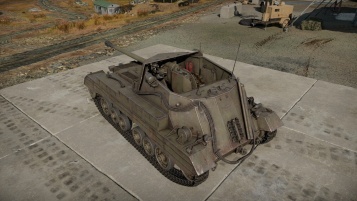 The Archer is a unique tank destroyer, as its gun faces the rear of the tank. The Archer can be good at both close combat- so long as you have somewhere to retreat to- and is also good at sniping. In a sense, you might consider the Archer to have two forward directions. The Archer's armament is very good at this battle rating. The same cannon is even used on Rank III and IV tanks like the A30 Challenger and the Firefly. It's 9.0 second reload speed is not bad, but there are faster firing cannons at this rank such as both short and long German 75mm cannons, or the M4A1's cannon. However, the Archer can instantly destroy many enemy tanks, and if it doesn't destroy them it will damage them. If the enemy is not destroyed and they can shoot you, retreat and reload. Once reloaded you can try to destroy the enemy tank, but if its aiming in your direction you can try sneaking up on it. 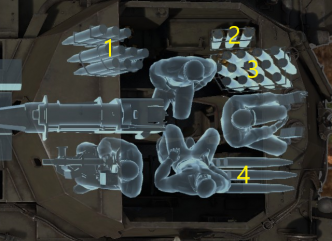 The Archer does not have a turret, but its gun can traverse further left and right than most non-turreted tank destroyers, including the StuG III F and SU-122. While these tank destroyers have a higher battle rating than the Archer, you may still encounter them. "Front" of the vehicle is the direction the driver is facing. Suspension wheels, bogies, and tracks are 20 mm thick. Ammo racks of the Archer. You should use the true forward direction (Opposite of the gun) to travel from place to place as its reverse speed is low. You should travel in the direction of the gun when approaching an enemy or an area with combat taking place. Once you can shoot the enemy, fire around at them and quickly go in the true forward direction to retreat. The same applies to when you're sniping, fire a shot and retreat. Again, the Archer can be played in both close combat and sniping, but be sure not to get too close. The Archer has an open top, so you will need to be careful about machine guns and artillery. Its faster forward speed can allow you to escape from planes who are attacking you. You should also note that the Archer is faster than all three Valentines. While it is based on a Valentine, its reverse speed is about double the reverse speed of a Valentine, and its forward speed is about 9 km/h faster. Whenever facing tanks of any battle rating and rank, always be on alert and always have a backup plan as most tanks may be able to knock out the Archer in one shot. Do not worry, always play safely and stay at a reasonable distance from the cap circle or in an area which can be a chock point for the enemy team. Always make sure you are in an area where they have to face the tank from in the cannon's arc to always have a first shot opportunity and have the enemy back off from charging straight into the Archer's field of fire. If a plane or tank starts strafing the Archer, pull out and find a new location as that place is now compromised and a wary pilot or flanking enemy could put an end to the Archer's career. As usual, it is recommended to research "Parts" first, particularly due to the vehicle's need to expose its engine to aim at an enemy. Engine damage is, of course, very crippling, and unfortunately a recurrent phenomenon for the Archer, and as such repairing, it is a priority whenever it occurs. After that, you should research the Horizontal Drive because Archer's turret traverse speed is sluggish. The production of the 17-pounder anti-tank gun for British service gave the British military firepower capable of destroying the heavier German tanks, however, the gun's heavyweight and bulkiness presented a mobility issue for the crew. An attempt to make a mobile version was done in 1942, first with the 3 inch Gun Carrier as a self-propelled mount, then with the M10 tank destroyer from the Americans which proved more successful. Another project done was to use obsolete tank chassis and convert them into mounts for use, like the Crusader cruiser tanks and the Valentine infantry gun. 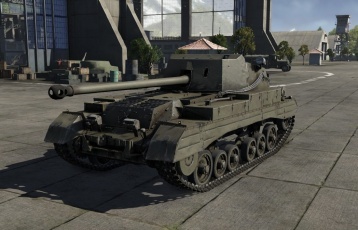 The Valentine was chosen for further development as it was one of the more reliable tanks in British service and had the specifications needed to mount the gun. The modified Valentine, known as the Self Propelled 17pdr, Valentine, Mk.I, Archer, was given a more powerful engine and a casemate superstructure on the front. The most distinctive feature of the Archer compared to any other tank destroyers in the war was that its gun is not facing forward, rather to the rear. This had a benefit of reducing the vehicle's length by making the gun stretch out over the rear hull of the vehicle, limiting the gun from extending over the vehicle. The rear gun mounting, despite its unorthodox method, allowed the Archer to become an excellent ambush weapon, by firing at targets with its gun and able to speed away forward at full speed rather than the reverse. The first prototype of the Archer was made in 1943, trials were carried out in April 1943, which concluded favourably and was 800 was ordered from Vickers and accepted into service in October 1944. Vickers were able to complete 655 Archer tank destroyers from March 1943 to until the end of the war in May 1945. The Archer was used in the Italian front and the European campaign against Germany. As a self-propelled gun, the Royal Artillery had authority over the tank destroyer just like other tank destroyers in British service. Reception to the Archer proved that the crews favour the Archer over the M10 Achilles due to the better tactics the Archer presented by shooting then speeding away before the enemy could discover them. Though the drawbacks of the crew positions, open-topped superstructure, and limited gun traverse limited the Archer's capabilities, this was mitigated by its role as a tank destroyer and was used in World War II until the end. Britain continued to use the Archer up until the 1950s. Once retired, some were sold to the Egyptian Army, to which they reported using it during the Suez Canal crisis in 1956. After that, no further action reports are known with the Archers. Skin and Camouflages for the Archer in Warthunder Live. This page was last edited on 22 April 2019, at 01:39.